Sitting for 8 to 9 hours a day at work is a way of life for most of us today, and unfortunately this cannot be avoided. But what about the remaining 15 to 16 hours? Even if we subtract 8 hours for sleep, 3 hours for personal and domestic chores, we are still left with 4 to 5 hours in a day. How do YOU spend those spare hours? Most people would sit and watch TV, sit and chat with family/ friends, sit and play indoor games, sit and .........the list goes on. 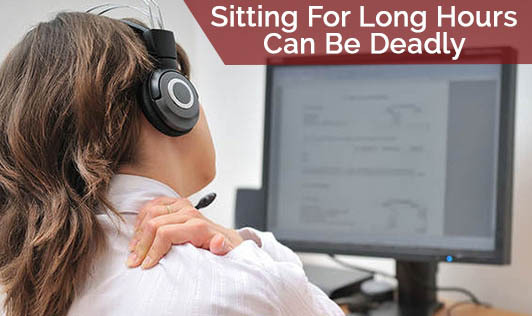 Experts say that prolonged sitting over a long period can be deadly. Some studies done by sports researchers say that people who spend a lot of time sitting, increase their chances of weight gain, heart disease and death. They also say that even for people who exercise regularly, prolonged sitting can cause changes in the body. After 4 hours of continuous sitting, the body's regulation over the amount of glucose and fat starts to shut down. This can increase the chances of metabolic syndrome. So, next time you want to speak with your colleague in the office or chat with family/ friends or watch television, WALK or STRETCH or PACE up and down. Move your body as much as possible at office, while traveling, at home, everywhere!